Photographer Clint Thayer spent the past week in San Francisco to attend DrupalCon. Before the onslaught of all things technical, he took two days to photograph the breath, rhythms, and life of the city. Here, he shares his thoughts. Creativity requires contemplation, and contemplation requires time. It's important to retreat on occasion from the normal daily workload to focus on new and experimental concepts that are outside of life’s normal reach. These breaks also allow the mind time to wander and stretch. In that vein, I’m pleased to share my most recent experimental photo wanderings – conducted as I literally wandered through San Francisco, CA. During this trip, my goal was to walk outside the comfort of my traditional subject matter, while at the same time applying experience gleaned during the last year of shooting. I decided to focus on two subjects: strangers, and architecture, each within context of the unique culture of San Francisco. The following images are a brief photo essay showing the product of this work. Please feel free to navigate to the gallery using the link at the bottom of the post to view additional images. 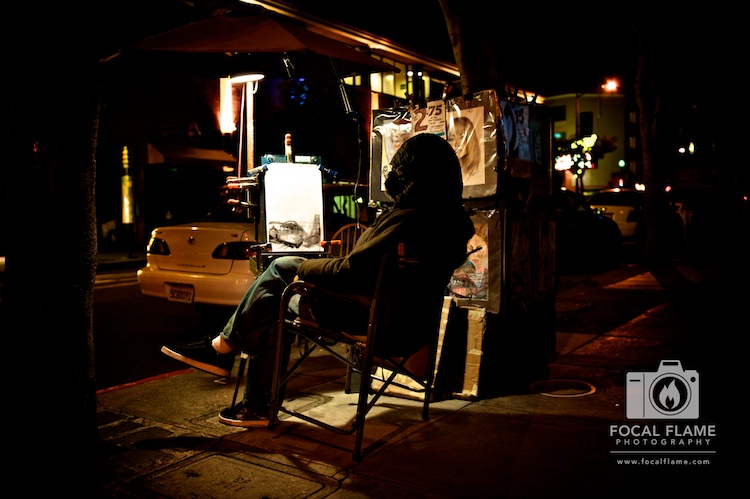 This photograph was taken in the Mission district area where specific allyways are considered fair game for artistic expression. I loved the angles, lines, and juxtaposition of the street art below the upper-middle-class housing. Walking along the tourist area on the wharf allowed the opportunity to capture some great images of street vendors and artists. The artist in this image exuded calmness while seated in his "home." While not visible here, a further study of his work revealed a deep level of detail and passion. When I walked around to face him he was wide awake, and just smiled at me. He was rich on life, and he knew it. In studying the impact of people on place and vice versa, I sought out areas in the city that are usually densely populated, but for some reason, were void at the moment. This empty street car is such a setting. This image is one that will stick with me for a very long time. While walking from point A to B, I happened to walk by the well-known Hippy Hill in Golden Gate park. The hill had abundant imagery, but this drum circle was the nexus of the activity. One by one, people would walk into the circle and start to dance. Dancers would spur drummers, and drummers would spur dancers in a back-and-forth symbiotic relationship. This homeless man in the wheelchair joined in with exuberance. I took this image within the Height-Ashbury district. It forces the viewer to have to make a conclusion about the woman in the foreground who is leaning against the building with very limited information. What do you think she is doing? You might be surprised. After spending two days walking around San Francisco, one thing is clear - this city is rich in architecture imagery. I wanted to try to capture the feeling I had walking up and down the hills looking up at townhouse after townhouse. Rows of these unique boxes are staggered across the city. If you would like to see more images in this series, please take a look at the gallery Only in San Francisco. As always, feel free to leave a comment, or share this page on Facebook or other social networks with the button below. If you are not already a fan of the Focal Flame Facebook page, or follow us on Twitter, it's time to jump in with both feet!